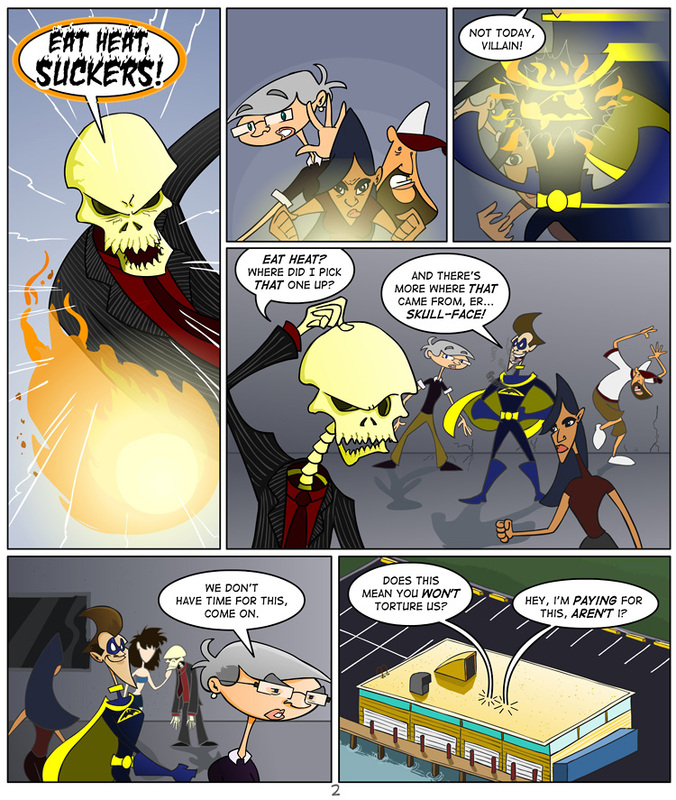 Digital Strips Adventures » Archive » Episode 2, Page 2: Eat Heat, Suckers! Episode 2, Page 2: Eat Heat, Suckers! In that first panel, Mephisto sees more action than he saw during the entire run of Captain Excelsior. Kinda sad that his big line had to be so cliched and pathetic, huh? So, it appears Midnight picked up some superpowers in this universe, including super-speed and invulnerability of some degree. Or did he always have these powers? One of the many mysteries we’ll be exploring in the episodes to come. It was fun drawing a lifeless, concrete building after illustrating a dead, gray meeting room, really it was, but the coming episodes are worth checking out for the change of scenery alone! See what I mean next Monday! It’s only because they’re in a superhero world and, obviously, he’s a superhero. Or at least thinks he is. Either way, it’s apparently powerful enough to give him some sort of super powers while he’s there. And who’s to say The Geek won’t develop some before it’s all said and done?